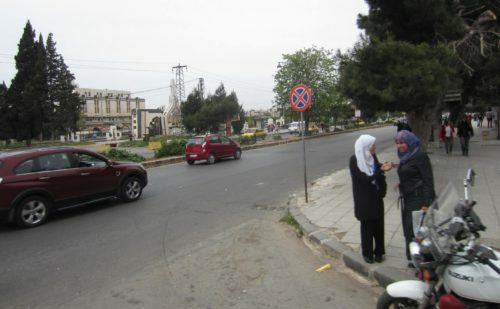 Beginning in the Fall 2011, militants from the Farouq Battalion set up checkpoints, killed security and soldiers and gradually took control of the Homs neighborhood called Baba Amr. They called it a “liberated zone”. By the time Marie Colvin and other journalists arrived, most of the civilians had fled the fighting to stay with friends and family in other parts of the city. The night before her death, Marie Colvin did live interviews on BBC, Channel 4 and CNN. The CNN interview began by showing video of a baby dying from a shrapnel wound. 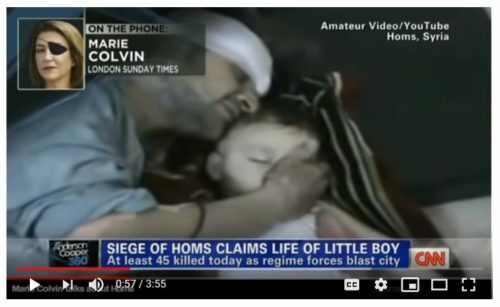 CNN believed Marie Colvin was an eye-witness to the baby’s death. Anderson Cooper asked Colvin what it was like to be in the room. Marie Colvin replied that the room was chaotic and the baby’s death heartbreaking. She dramatized the situation by speaking about the baby’s grandmother being a volunteer in the room when the baby arrived. However, Colvin was not in the room at all. Marie Colvin and the media activists were shown the video on a laptop computer by their FSA guide. (page 155, “Under the Wire”). In her CNN interview Colvin described Baba Amr as “28,000 civilians, men, women and children, hiding, being shelled, defenseless…. There are no military targets here…. 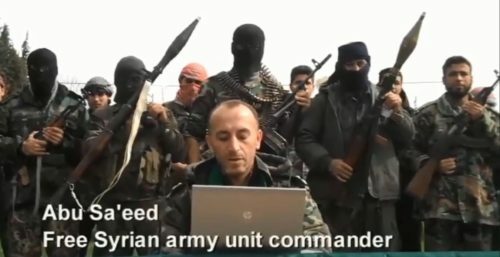 So it’s a complete and utter lie that they (Syrian military) are only going after terrorists…. The Syrian Army is simply shelling a city of cold, starving civilians.” In reality, Baba Amr was the primary base for militants of the Farouq Battalion. If there was an “utter lie”, it was pretending that this was primarily a civilian neighborhood. The Observer Mission witnessed acts of violence being committed against Government forces and civilians that resulted in several deaths and injuries. Examples of these acts include the bombing of a civilian bus, killing eight persons and injuring others, including women and children, and the bombing of a train carrying diesel oil. 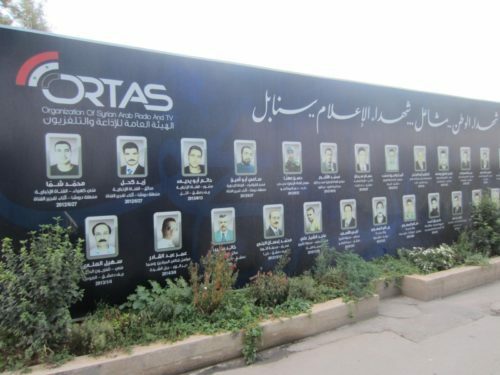 In another incident in Homs, a police bus was blown up, killing two police officers. A fuel pipeline and some small bridges were also bombed. In her final article for the Sunday Times Colvin says, “In Baba Amr, the Free Syrian Army (FSA)…. have virtually unanimous support from civilians who see them as their defenders.” This claim is highly dubious. The vast majority of civilians had left Baba Amr. All that were left were family members of FSA militants and others who had nowhere to go. I just watched “A Private War” and immediately saw through the pro-regime change propaganda that was heavily promoted regarding Libya and Syria and it made me sick. We fomented both conflicts and then cry foul and blame casualties on the strongmen in charge. I’m pretty sure we wouldn’t have near the migration issues and a much more peaceful ME if we had left Iraq, Syria, Libya alone. Pathetic movie, almost unwatchable. Pretty sure Marie Colvin was CIA all the way.